Must watch for information. I’m not saying that we have to agree or disagree with him. This topic is not easy answer. Of cause we want the true democrat in Thailand. Neither Yellow shirt nor Red shirt really pursuit of democracy. After watching this VDO, I wished they had invited the opposite side to discuss in this lecture. Ji didn’t tell everything, just the point he wanted to illustrate. Last Saturday, we had a birthday party for my friend. I also took this opportunity to test my new Flip Mino HD camcorder. Due to a space limitation, I had to convert the movie to lower quality. Flip Mino HD Review: It’s darn good. Good light, good sound, easy to use, OK HD camcorder, and much cheaper than a pro-HD camcorder. Sigh…I got to grade a big pile of student’s exams by this weekend. I already knew the average of a multiple-choice section. It’s about 60%. I hope they did well in the short-answer section. I’ll be very fair for them. After grading 1/4 of the exams, most students did not do well. It took me a long time to read student answers due to students confusion in the answer. I gave them very generous grade, but the average is still very low this time. Sorry , poor students. 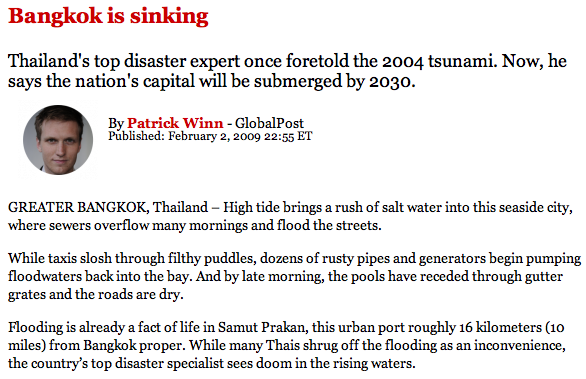 I found this article Bangkok is sinking by Patrick Winn. He wrote and made an animation show Bangkok city Submerged by 2030. Well…his info based on Meteorologist Smith Dharmasaroja, head of Thailand’s National Disaster Warning Center. Window 7 beta ได้ออกมาให้ geeks ดาวน์โหลด และทดลองใช้มาตั้งแต่เดือนที่แล้ว. ผมก็มีโอกาสได้ดาวน์โหลดมาเก็บไว้ และขอ Serial Number มาด้วย. วันนี้ได้มีโอกาส install ลงใน Macbook via VMware, ซึ่งแบ่งเนื้อที่ให้ 40GB, CPU 1GHz, Ram 1GB. การ Install ผ่านอย่างราบรื่น และรวดเร็ว (เร็วการ Window Xp มากๆ). Window 7 ดูสะอาด “look clean”. ที่ผมชอบอีกอย่างก็คือ Libraries ใน Window File Explorer, ซึ่งคล้ายกับ Finder ของ Mac. เราสามารถเพิ่ม folder เข้าไปใน Libraries ได้ โดยที่ไม่ต้องก๊อปปี้ไฟล์เข้าไป (คล้ายๆกับ Shortcut). 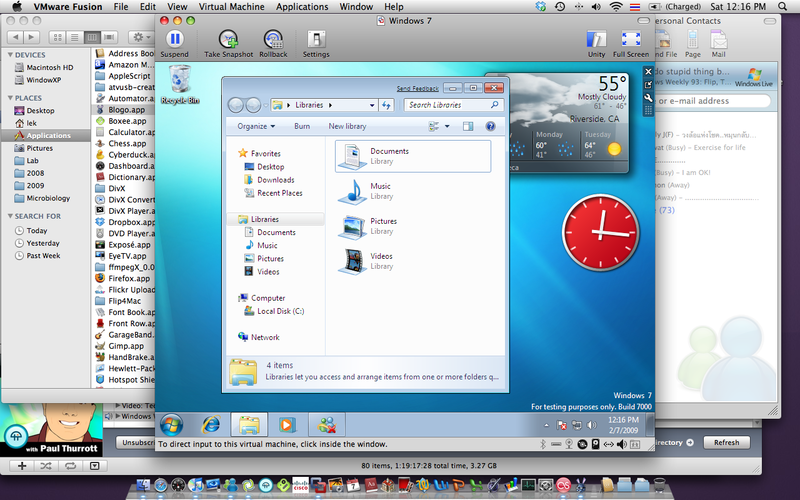 I installed on my Macbook using Bootcamp. It booted up very fast and look very nice. Sadly, bootcamp is not support Window 7 64-bit yet. So I still can’t use multi-touch, iSight, function of keyboard, etc.